Loretto Bay Las Vegas homes by Pageantry are priced in the high $100,000s and offer immediate move ins within Green Valley. Green Valley in located in Henderson real estate. Three neighborhoods in the gated Loretto Bay community, includes Villa Azure, La Tesoro and Bella Lago are priced affordably up to the mid $200,000s. Some of the new Las Vegas homes have a 30 day move in. The three developments include La Tesoro, a townhouse community, Villa Azure, a condo complex and Bella Lago a single family home development. The community offers 11 home floor plans that range from 1,139 to 2,381 square feet. 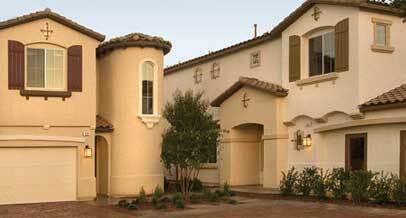 La Tesoro is a two story townhome community with prices starting in the low $200,000s. The townhomes include three bedrooms, 2 ½ baths with 1,406 to 1,862 square feet. Some architectural features include upper balconies and porches. There are two single story homes at Villa Azure. Plan One has three bedrooms, two baths, patio and 1,272 square feet. Condo prices start from $179,900 at Villa Azure. Plan Two offers 1,139 square feet, two bedrooms, two baths and a private patio. Single family homes in Henderson, Nevada are located in Bella Lago. Bella Lago homes include their own private gate with brick driveways and pavers. The Henderson homes for sale are priced from the mid $200,000s. and are two story. Plan One and Two floor plans include three bedrooms. There are four bedrooms offered in Plan Three. Standard features include paver driveways, Whirlpool appliances, panel doors with lever locks, prewiring electrical package, pantries and energy efficient low-e windows. Call 702-505-6988 for VIP Las Vegas condos buyer or seller representation by a Las Vegas real estate agent. Loretto Bay Las Vegas homes by Pageantry are priced in the high $100,000s.